This weekend was the 50th anniversary of the Northern Territory Wave Hill walk-off by the Gurindji People. It eventually led to one of the most iconic moments in Australian race relations: Prime Minister Gough Whitlam pouring sand into Vincent Lingiari’s hand. The strike had massive consequences, positively for land rights and negatively for Aboriginal employment in the stock industry. The collapse of that employment led to profound consequences still being felt today. In the early 1960s Indigenous people were the bedrock of the pastoral industry in northern Australia. They were cheap labour, governed under the Wards’ Employment Ordinance in Queensland and the NT. The Ordinance set low wages and poor living conditions and excluded Indigenous people from industrial awards. Indigenous groups were pushing for equal pay for equal work, a move resisted by the pastoral industry. In September 1963 the ACTU adopted a comprehensive statement endorsing equal wages. The move targeted pastoral workers unions, the AWU and North Australian Workers’ Union, initially indifferent to the plight of Aboriginal workers. The NT Cattle Producers Council appealed to the Conciliation and Arbitration Commission for a full bench hearing to keep the clause excluding Aboriginal workers. The NT Council for Aboriginal Rights said the cattle industry exploited their people on low wages for years and “kicked us, whipped us, shot us, and raped our fairest daughters”. In 1964 a big Darwin rally increased pressure on NAWU. The newly-formed Australian newspaper under enlightened editor Adrian Deamer and the Melbourne Herald’s Douglas Lockwood lent publicity to the cause, highlighting appalling conditions at British company Vesteys’ operations. Cattle Producers Council lawyer John Kerr, later the Governor-General who sacked Whitlam, detailed evidence drawing on supposed racial knowledge over many decades to show cultural differences made Aboriginal people less useful workers. An Aboriginal stockmen loudly complained in court “you plenty liar” but Kerr’s case was not effectively countered and the Commission accepted it. It was not until the full ruling in March 1966 the Commission embraced equal wages but in a compromise deferred it until December 1, 1968. The Commission accepted the employers’ argument that repeal of Wards’ Employment Ordinance would greatly increase costs and also lead to unemployment and displacement of workers and dependents. In time this is exactly what happened. However this was not the fault of the Indigenous workers. Indigenous NAWU organiser Dexter Daniels complained about the delay. Daniels had been to Kenya in 1964 and seen how black people were winning rights from colonial masters. “Our people have been waiting more than 50 years, and they should get the award straight away,” he said. Daniels organised a strike of 80 Aboriginal workers at Newcastle Waters and wanted to spread it to Wave Hill a few hours away to the west. Wave Hill was a 16,000 sq km pastoral lease with 40,000 cattle and employed the largest number of Aboriginal people in NT. The Wave Hill area was colonised in the 1880s and the station was bought around 1900 by British agribusiness Vesteys. At first, white cattle station owners killed many Aboriginals and ran others off the land; later they lured them with beef, flour and tea and exploited them as cheap labour. Wave Hill head stockman Vincent Lingiari, then 47, was in Darwin and Daniels arranged to meet him to see if he would join the strike. On August 22, 1966 Lingiari led 80 workers and 120 dependents in a walk-off to Wattie Creek. This was not the first strike at the station. They had walked off before in 1949, 1952 and 1955 but this was the first strike supported by a union. The Australasian Meat Industry Employees Union placed a black ban on Newcastle Waters and Wave Hill. In September unions and employers struck an agreement that “fully efficient” Aboriginal workers would get the full award rate, married men would get basic wage less keep and singles would get smaller increases and keep. A publicity tour led by Gurindji stockman Captain Major to southern capitals raised considerable funds. “You can see I have a black skin, but I have a white heart. What I want is a fair go for my people,” Major told his audience. The Gurindji refused to go back to Wave Hill. In October 1966 Labor MP Gordon Bryant read a Lingiari letter to parliament demanding the return of “tribal lands” belonging to “forefathers from time immemorial”. Author and journalist Frank Hardy was on his way north on holiday when he heard about the strike and he rushed to Wave Hill. Hardy later wrote about the struggle in his book The Unlucky Australians (1968). It took Hardy a while to realise the dispute was more than about pay. Lingiari explained they ultimately wanted to replace Vesteys with Indigenous owners: “One day last year we talk about these things, about hidings, about living in dog kennels, about white men taking our women, about bad tucker, about no pay. We decide then we got to go. Make our own way. We can do these things.” Lingiari told Hardy: “I bin thinkin’ in my mind we can run Wave Hill, without Bestey mob”. The Liberal Federal Government rejected the petition a few months later. But land rights was moving to the forefront of the reform agenda. Gurindji, Wave Hill, the Yolngu and Yirrkala would become major symbols of the battles that followed. The petition gathered 100,000 signatures by 1969 and when the Labor government was elected in 1972, Whitlam appointed Ted Woodward royal commissioner to consider how Aboriginal people could be granted land in NT. In 1975 Whitlam attended a ceremonial handover of Wattie Creek to Gurindji, widely regarded as an enormous achievement in Indigenous civil and land rights. But it took land rights legislation passed in 1976 to allow for valid claims on the basis of traditional association. The Gurindji 1976 claim for 3293 sq km of Daguraga Station was finally achieved in 1983. The events were immortalised in Paul Kelly’s song Big Things From Little Things Grow and it was indeed a great success in land rights. But it came at a terrible price. Most stations sacked their Aboriginal workforce rather than grant equal pay. A huge influx of itinerant populations came into towns with no work and no prospects. Many lives descended into alcohol and violence as a result. The era of great Indigenous stockmen and women “born in the cattle” was over. In recent years as a journalist I’ve attended all of the annual military commemorations in the towns I’ve worked in, Anzac Day, Remembrance Day and Long Tan Day. The format of the commemoration is almost identical for all three: the ode, the anthem, the minute’s silence, the last post, reveille, the lone bugler or piper. But each day has its own peculiarities. With all the Australian First World War veterans dead and not many left alive from the Second World War or the Korean War, the Vietnam Vets are taken their place as our most senior veterans from overseas conflicts. Unlike in previous wars, their placement in Vietnam was controversial as there was considerable opposition to Australian involvement in that war in the 1960s. Normally Australia took its lead from the United Kingdom but under then prime minister Harold Wilson Britain refused to commit troops to the conflict, leading to the famous Wilson quote to his cabinet that “Lyndon Johnson is begging me even to send a bagpipe band to Vietnam”. Of course Australia sent far more than just a bagpipe band. Prime Minister Holt would later go “all the way with LBJ” but Australian involvement began much earlier in the Menzies era. The Australian Army Training Team Vietnam was sent there in 1962 at the beginning of the conflict and Australia was involved right through to last days of the war 1974. Almost 60,000 Australians served in Vietnam. Of those, 521 died as a result of the war and over 3000 were wounded. The decision to send those soldiers to war was the cause of the greatest social and political dissent in Australia since the conscription referendums of the First World War. Many draft resisters, conscientious objectors, and protesters were fined or jailed, while soldiers, most of them draftees met a hostile reception on their return home. Many of those soldiers suffered post traumatic stress disorder, a condition that mostly went unrecognised at the time. While the reputation of those brave soldiers has rightly been rehabilitated over the years, many were never able to fully readjust to civilian life. I can understand their anger that Vietnam did not allow Australians attend the battle site at Long Tan (where 18 Australians died 50 years ago) but I also understand Vietnam’s reluctance in the matter. The country lost upwards of three million people in the war and the wounds are taking a long time to heal. In time it will become like Gallipoli, a place of shared sacrifice, but Australians must be patient. Though still ruled by the same Communist Party that took over the south in 1974, Vietnam is slowly becoming a wealthier country. Its 90 million people constitute the world’s 13th largest population and it is the world’s 37th largest economy in transition from centrally planned to market-based and from agrarian to industrialised. The transition is reflected in its foreign policy. Resolution No.13 by the Politburo issued in 1988 aimed to have ‘more friends and fewer enemies’ and Vietnam joined ASEAN in 1995. It is a claimant in the South China Sea territorial dispute, but wants it settled through negotiation and peaceful means, in accordance with international law. In 2015 Australia and Vietnam signed the Declaration on Enhancing the Australia-Viet Nam Comprehensive Partnership. The Declaration sets out an agenda to guide the strategic relationship and covers regional and international cooperation, trade and investment, industrial, development, development assistance defence, law enforcement and security. The Declaration builds upon the 2009 Australia – Viet Nam Comprehensive Partnership and the bilateral Plan of Action (2010-13). A new Plan of Action is due to be signed this year. The links between the country will only grow. In the 2011 Australian Census, 221,114 people in Australia claimed Vietnamese ancestry. Vietnamese represent the fifth largest migrant community in Australia and Australia is the second most common destination for Vietnamese migrants, after the US. Vietnam was Australia’s fastest growing export market in ASEAN during the 10-year period 2003-2013 (average annual growth of 16.3 per cent) and this trend continues. A minor spat over a minor battle (in Vietnamese terms) is not going to change that. What’s needed is a prime ministerial visit. No Australian PM has been in Vietnam since Julia Gillard in 2010. This is a relationship too important to let a dispute over access to a battle field derail it. Last month was the 40th anniversary of the Entebbe rescue mission, the Israeli mission to free hostages at Uganda’s Entebbe Airport. It remains possibly the most recent occasion when Israel held the sympathy of the entire world. Originally called Operation Thunderbolt, the world remembers it as Operation Entebbe while the Israeli army calls it Operation Yonatan to commemorate the raid leader and the only Israeli soldier to die in the action – Colonel Yonatan Nehenyatu, brother of Israeli Prime Minister Benjamin Nehenyatu. The cause of Operation Entebbe was the hijack of a French aeroplane one week earlier. On 27 June 1976, Air France Flight 139 to Paris was hijacked after take-off from the notoriously lax security Athens airport. Athens was a stopover; the flight had originated in Tel-Aviv. On board were 12 crew and 248 passengers. Ten minutes out of Athens, three men and a woman took control of the plane. They were two male PLO operatives and two members of the German Baader-Meinhof gang. They ordered the pilots to divert the plane to Benghazi in Libya. They spent seven hours on the ground at Benghazi where they refuelled and released a female hostage. The women convinced the hijackers and a hastily summoned Libyan doctor she was pregnant. The woman, who was in fact on her way to her mother’s funeral in Manchester, spent an anxious few hours in the airport terminal, and was then put on a plane to England. The hijacked flight left Libya in the early hours of 28 June and flew to Uganda. Ugandan leader Idi Amin had strong ties with the PLO and expelled the Israelis from Uganda after they refused to sell him Phantom jets. 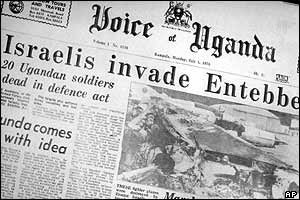 The Israeli embassy in Kampala was then offered to the PLO as headquarters. Amin invited the hijackers of Flight 139 to come to Uganda. At Entebbe airport, the hijackers were joined by three newcomers under the command of Wilfried Böse. Böse was known in German far-left intellectual circles as deeply anti-Semitic. Once Böse took over the operation, they began to make demands. They released all the non-Jewish hostages. They demanded the release of 40 Palestinians held in Israeli prisons and 13 other detainees held in Kenya, France, Switzerland, and Germany, or they said, they would begin killing the remaining hostages on 1 July. Under Ugandan armed guard, the passengers were transferred to the transit hall of Entebbe Airport’s old terminal. Amin paid a visit to the terminal and made a speech supporting the liberation of Palestine. Another Air France airliner was flown in to retrieve the crew and non-Jewish passengers. But Flight 139’s Captain Michel Bacos told the hijackers the passengers were his responsibility, and he would not leave any of them behind. Bacos’ entire crew, down to the most junior flight attendant, followed suit. A French nun also refused to leave, and insisted one of the remaining hostages take her place, but Ugandan soldiers forced her at gunpoint to join the 46 other non-Jewish passengers in the waiting Air France plane. The crew remained and disgracefully, Air France superiors later reprimanded Bacos for his actions. The freed passengers were questioned on arrival home by Mossad operatives who learned Ugandan soldiers were co-operating with the hijackers. They also got clues to the layout of the Terminal building. A day after releasing the first batch of passengers, the hostage-takers freed 101 more passengers leaving only the crew and the Jewish passengers in Uganda. On 1 July, the government of Israel offered to negotiate with the hijackers to extend the deadline to 4 July. Israeli General Chaim Bar-Lev, a personal friend of Amin, telephoned him on a number of occasions to negotiate but achieved nothing. On 3 July, the Israeli cabinet approved Operation Entebbe under the command of Brigadier General Dan Shomron. Planning for the raid took several days. The terminal was built by an Israeli construction company (common in Africa at the time). The company gave the building blueprints to the Army and they built a partial replica of the transit hall. The builders were kept under supervision so Israel would not lose the advantage of surprise. The plan called for troops to fly to Entebbe airport and drive to the Old Terminal in a black Mercedes with Land Rover escorts. This would fool the Ugandan guards into believing Idi Amin was paying a visit. Backup aeroplanes with medical facilities were sent to Kenya, an implacable enemy of Amin happy to assist the rescue. The aircrafts took off from Israel on the 4000km journey in separate directions so as not to arouse suspicion, and flew at less than 30 metres over the Red Sea to avoid Egyptian and Saudi radar. At 11pm, they touched down at Entebbe and the Mercedes and Land Rovers – packed with elite Israeli commandos in Ugandan army uniforms – rolled out. The raid lasted three minutes. An initial confrontation occurred near the control tower, when two Ugandan sentries who stopped the convoy were shot dead. With the element of surprise gone, the troops raced to the Old Terminal where Netanyahu was fatally wounded. In the ensuing firefight, all seven hijackers were killed as well as 24 Ugandan soldiers. Three hostages were also killed in the crossfire. Hostage Dora Bloch ,75 was not rescued because she was in Kampala hospital due to a choking fit. A day later, she was murdered on Amin’s orders. The survivors were herded onto the transport planes and took off at 11.52pm to Nairobi. An infantry team sprayed machinegun fire at seven Ugandan MIG fighters to ensure they would not take off in pursuit. The last of the fighters left Entebbe at 12.40am. The mission returned to an air force base on Israeli soil on 4 July with 98 freed hostages. They were fed and given medical checks before flying on to Tel-Aviv. There the planes released its celebrated cargo into the outstretched arms of their relatives and friends and an appreciative crowd of thousands of wellwishers. Uganda convened a session of the United Nations Security Council to seek official condemnation of the Israeli raid as a violation of Ugandan sovereignty. Many countries agreed with the Ugandan resolution. However, the Security Council ultimately declined to pass any resolution. On the 40th anniversary Benjamin Netanyahu travelled to the country where his brother died becoming the first Israeli prime minister to visit Uganda since the crisis and the first to visit Africa in at least 30 years. Netenyahu was keen to stress Israeli-Ugandan relations had moved on. “This is a deeply moving day for me,” he said. “Forty years ago they landed in the dead of night in a country led by a brutal dictator who gave refuge to terrorists. Today we landed in broad daylight in a friendly country led by a president who fights terrorists.” However it remains moot whether the label of terrorist could also be applied to Netenyahu over his treatment of Gaza and the West Bank, and his host Yoweri Museveni who has ruthlessly crushed opposition in his 30 years as Ugandan president. Last week I hitched a lift with the local state MP on a charter plane up to the Gulf of Carpentaria. He was up there to check out a couple of schools in Normanton and farewell a ship in Karumba exporting live cattle to Malaysia. Not having been that far north in the Gulf, I eagerly took up the offer. We took off from Mount Isa heading north past Glencore’s massive George Fisher zinc mine about 20km out of town. The familiar rolling hills of the Selwyn Ranges seem to go on forever. The next notable landmark from the air is Lake Julius dam. The dam wall is located just below the junction of the Leichhardt River and Paroo Creek 70km north-east of Mount Isa. This mine to the north of Julius Dam is Mount Margaret copper mine which closed in 2014. The further north we got, the flatter the landscape became. This is Gulf cattle country, home to vast stations the size of European countries populated with many thousand cattle, but just a handful of people. As we descend into Normanton, the winding path of the Norman River comes clearly into view. Rising near Croydon it meanders north-west past Normanton to empty into the Gulf at Karumba. The township of Normanton has a population of around 1500 people, with well over a third Indigenous. The colourful Purple Pub is one of Normanton’s three watering holes. Normanton’s most popular tourist attraction is probably Krys the Crocodile. The life-sized status is named for Polish immigration Krystina Pawlowski. In July 1957, Pawlowski killed Australia’s biggest known crocodile with a single shot on the banks of the Norman River near Normanton. The saltwater crocodile was enormous, measuring 8.63m, over twice as big as the ones that normally ply the waters around these parts. After admiring Krys’s girth (the croc, not the human), it was back on the plane for the short hop to Karumba, 70km away. The tidal salt flats seem to stretch on forever. The Port of Karumba comes into view near the mouth of the Norman River, with the cattle boat visible in the photo. The large white building is the port facility for MMG’s Century Mine, which closed down last year. Its closure brought an end to dredging which threatened to end the viability of the port. After much prompting (including by my newspaper), the state government has taken up dredging and port traffic is flowing again. Karumba is divided into two halfs. As well as the Port, there is Karumba Point on the mouth of the river with a more residential and tourist focus. This is the only place on the Savannah Way drive from Cairns to Darwin right on the Gulf. The view from the Kuramba Point Tavern is well worth the drive alone. There was time for one quick beer before we set off on the hour long flight back to Mount Isa.